The hydraulic test cases from Stauff have been a popular item with maintenance and service personnel for many years. In addition to analog and digital pressure gauges, they can also be equipped with test couplings and hoses, connection adapters and other accessories. Numerous standard versions can be ordered directly from stock. Due to the growing demand of the market for the customized and optimized provision of tools, Stauff has seen an increase in orders for fully customized service cases. This applies to size, materials, design, and marking of the actual cases as well as to the selection and arrangement of the included components. 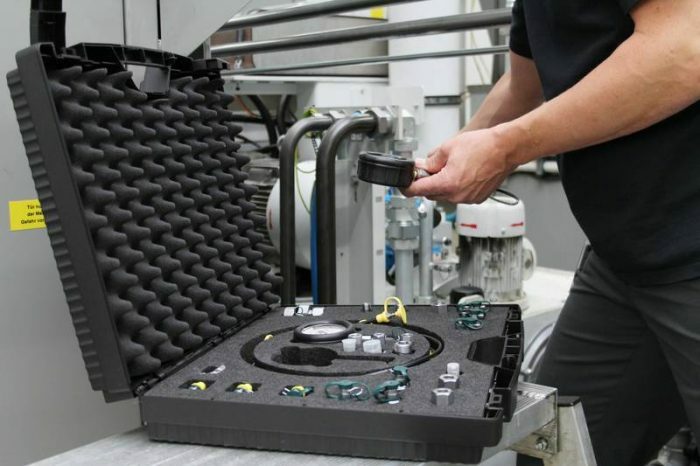 A special focus is always on the rigid foam inserts which ensure secure positioning of the individual components while allowing their easy removal. These are usually made from materials which have an exceptional long-term resistance to common hydraulic media. If required, it is also possible to add third-party products to the cases, for example, special measuring and test devices or connection adapters which are not part of the regular Stauff range. This currently includes around 40,000 line components and other hydraulic accessories for mechanical engineering, plant engineering, and industrial maintenance, as well as a large number of special and system solutions which are manufactured to customer specifications or based on own developments.